Go Cart belt - Comet 300621 Go Kart Belt, Comet 500/858 Series. Belt #704039, Used in People Movers, Golf Carts, Mini-Bikes, and ATV's. Home > COMET INDUSTRIES BELTS > Comet 300666 (A-C) Drive Belt. Comet Industries 300666-704126 BELT. > Comet 300661 Go Kart, Golf Cart, and ATV Belt. > Comet 300315A SPRING FOR 858 Series TORQUE CONVERTER - "NATURAL" COMET 858 DRIVEN Clutch. > COMET 300621, Comet Industries belt replacement for 500/858 Series, 704039 Go Kart belt. COMET 300621 - Replaces original Comet 704039 for 500/858 Series. Go Cart Belt #300621A. COMET 300621, Comet Industries belt replacement for 500/858 Series, 704039 Go Kart belt. Comet 300621 Go Kart Belt. 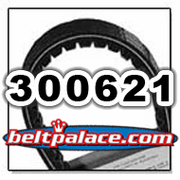 Replacement belt for Comet Industries 500/858 Series. COMET 300621 and 300621A. This Go Kart torque converter belt measures 0.92 Inch Width, 33.24 Inch Length. Symmetric Cogged belt. For use with 500/858 Series. This Drive Belt is a common Go Cart belt, Golf Cart clutch belt, People Mover clutch belt, and Mini-Bike drive belt. Comet 302245A - 500 Series Drive Clutch. 3/4� Bore. Comet 500 Series 3/4� Bore Torque Converter System (Symmetrical). Comet 302679A. Comet Industries 500 Series Driven Clutch. 7/8� Bore. Comet/Brister�s Part 302679-A. Drive belt for Brister�s Chuck Wagon (CW-11 and CW-13) and Land Master with Comet Industries Torque Converters.